I also heard this broadcast here in Gateshead, North East of England (QTH locator IO94ew) with my YAESU FT100 HF Radio and a DELTA LOOP for 20m up in the Attic. Signal strength was S9 at this end. Back when VOG first came back from the dead, I made a two hour recording of it and tried to upload it to YouTube. I thought they might only be around for a short time and wanted to share the programming in a way that would be easy for everyone to access and enjoy, but the copyright bots on YouTube hit me with something like 73 copyright claims and the video was taken down within seconds. Oops! The recording wasn’t THAT good of quality, coming from Alabama, but it was a good representation of their programming. I hate it that I was unable to find a way to keep it online somewhere. None of the public online audio/video sites seem to have any way to challenge copyright strikes. Again a song by George Zambetas, Kyrie Aleko. I think the whole program was a tribute to Greek pop music composer and singer, George Zampetas! I am a bit busy to listen to all of it but I hope that I help you so far. Wow! Thank you for this detail! Yep, Voice Of Greece is an oddball. About 2 1/2 years ago, I’ve decided to do something with that existing group of RG-6 cable that went throughout the house here. The previous owners had satellite TV in every room. So, instead of rippin’ that all out, I made it so that SW and MW could be RX’ed throughout the house from one 70ft longwire antenna. To test that I used an Eton E-10 portable an ran into this great sounding, very strong, station in the 31M band. The music was interesting as well, but no announcements and ID’s. Folks at the FRN.net told me that it was V.O.G., so I programed it into some radios’ memories. Then, it just disappeared. 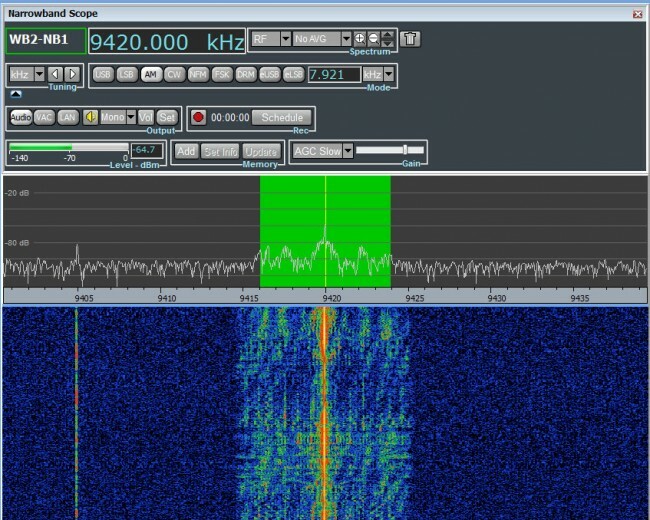 Finding them again almost like pirate hunting with their irregular scheds, but what a great sounding station when you do find it.